Baked chicken breasts filled and rolled with spinach and ricotta topped with Pomodoro sauce and melted mozzarella. These stuffed chicken breast are family friendly and so good! Perfect for a large crowd, or to feed a hungry family. Serve with a big salad. Leftovers are perfect for lunch the next day. 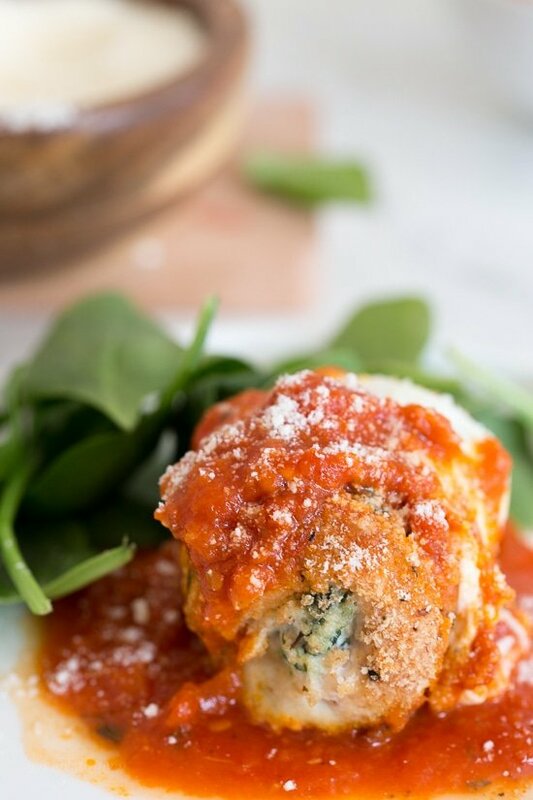 Since making chicken rollatini stuffed with prosciutto and cheese a few weeks back my husband has been craving chicken rollatini the way he grew up eating it, stuffed with cheese and topped with sauce and more cheese. I had to sneak some spinach in them against his will, but he was very pleased with the final results. I guess you can say this is a cross between my Chicken Parmigiana and Spinach Lasagna Rolls. 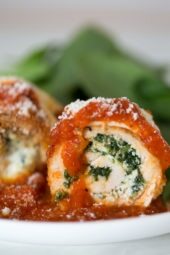 Baked chicken breasts rolled with spinach and ricotta topped with pomodoro sauce and melted mozzarella. A dish the whole family will love! Wash and dry cutlets, season with salt and pepper. Combine breadcrumbs and 2 tbsp grated cheese in one bowl and 1/4 cup egg beaters or egg whites in another. 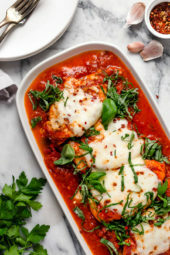 Shred or finely chop 1.5 oz of mozzarella cheese and combine with remaining grated cheese, spinach (make sure you squeeze it dry), 2 tbsp egg beaters, and ricotta cheese. 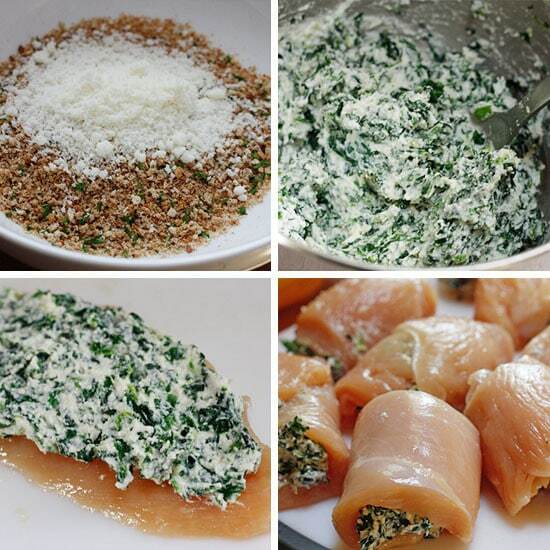 Lay chicken cutlets down on a working surface and spread 2 tbsp of spinach-cheese mixture on each cutlet. Loosely roll each one and keep seam side down. 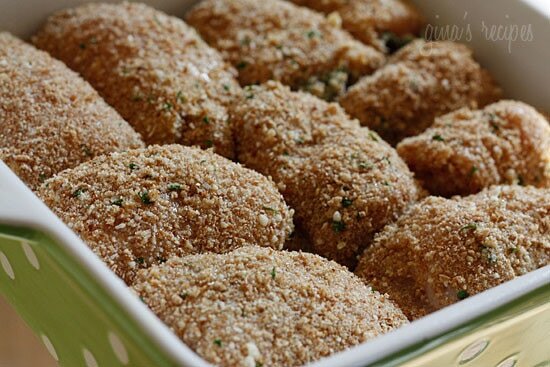 Dip chicken in egg mixture, then in breadcrumbs and place seam side down in a baking dish (no toothpicks needed). Repeat with the remaining chicken. When finished, lightly spray with olive oil. Bake 25 minutes. Remove from oven, top with sauce then cheese. Bake until cheese is melted and bubbling, about 3 more minutes. Serve with additional sauce on the side and grated cheese. I made this tonight for my family & it was a huge hit! I added some pesto to the spinach stuffing simply because I love pesto & it seemed appropriate! I also made it a little lower in carbs by using low carb bread mixed with almond flour for the bread crumbs!…fabulous recipe! Very tasty! This recipe was fabulous! My husband and kids LOVED it! Thank you! When I made this dish I didn't have any spinach but did have chopped broccoli. Yummy!!! It is now a family favorite! I just made this and it is SOOOO gooooddd! I had to add a little cream cheese to the cheese-spinach mixture because my ricotta cheese wasn't very creamy. I also left half of the chicken breasts w/out tomato sauce and cheese and they were amazing as well. Thank you so much for the recipe! Wow! Made this for my Sweetheart for Valentines. It was a hit. We both loved it. I did especially, one of my favorite places to eat out is Olive Garden. I haven't been there in ages. This made me feel so special, even though I cooked (which I love to do) I felt like we were eating at a very nice restaurant. What a treat! I will definitely repeat this meal. I am making this tonight for our Valentines dinner tonight. Can't wait to actually eat it! Thank you! Making this tonight!! So excited about it- looks absolutely deliscious! I made this for Sunday dinner…..so yummy! I want to thank you for making weight loss easy. My husband is having a great time tasting all the new and "healthy recipes". Love, Love, Love skinnytaste! This was so amazing and so easy to make…almost husband said it was restaurant quality!!! Love your site and can't wait to try another delish dish! This was incredibly easy to follow, everything down to the cooking times were exact. I have never felt more proud after making any dish! My husband loved it and that made me feel good! Thank you so, so much. it sounds so good! 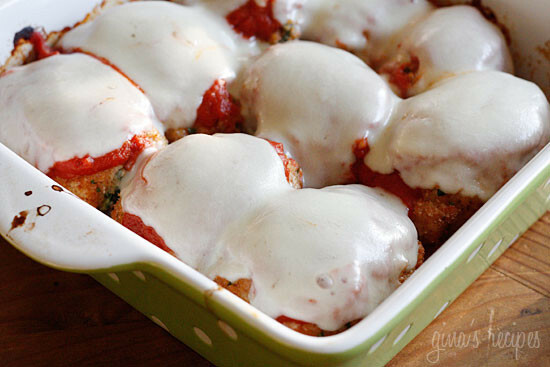 Its like chicken parmesan! I've been following this site for a while but this is the first recipe I made. It was so delicious! Thanks so much. Delicious!!!!!! My husband said this was top 5 dinner I have ever made!! Trying your chicken enchiladas next! 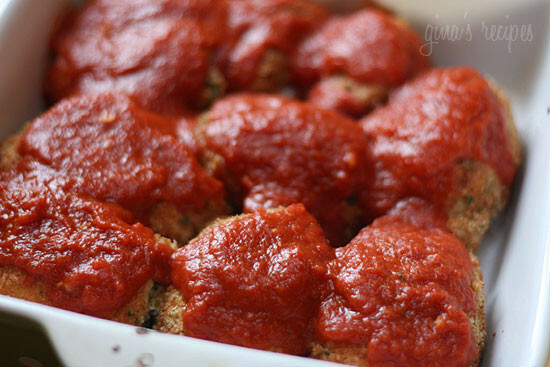 Is there a way to make this without breadcrumbs? This looks yummy but I need to avoid grains as part of a diet I am on. PS LOVE all your recipes I have trie so far! You could use ground nut/seed flours (think almond, hazelnut chestnut flour…ground golden flax seed…crushed plantain chips or even crushed pork rinds OR crushed asian "beignets de crevettes" (the round snack chips made of manioc and shrimp!)! Found this recipe via Pinterest, just made these tonight and WOW! So tasty!! The local grocery store has the very nicest boys working behind the meat counter–I grabbed a pack of tenderloins from the case and they ran them trough their magic tenderizing machine. They worked perfectly! I also made this tonight with the Parmesan green beans. My roommate could not stop saying how much he loved everything. I just found your website and have already recommended it to so many friends! Thanks so much for the great recipes! Made this tonight for my first meal on weight watchers. If every "skinny" meal tastes this good, I will be on weight watchers for the rest of my life!!! Thank you!!! Made this dish last night (used fresh spinach) and it was such a HIT! I will make is over and over again. I stuck to one serving and my husband ate 3!! I think he would have had more if I hadn't packed up the rest for lunches 😉 thanks for making me the hero tonight! These were fabulous. I am a weight watchers member and I am always looking for new ideas for lunch and dinner that will fill me up. This definetly did the trick. I had them for lunch and dinner for 3 days. I could not get enough of them. This recipe was lick the plate delicious! I cooked them and froze the extra portions and they were just as amazing reheated. It sure did help! I made it last night and my husband actually said it was "Fantastic!" I have never cooked before and everything ive tried he has loved! In the second bowl is it the egg whites with the breadcrumbs or the eggs with the cheese? LOVE the blog! Ive never seen stuff so easy and everything I have made so far has come out great! Made this tonight and everyone, including my picky 16 month old, loved it. Thanks for sharing!!! I made this one last night, and it is amazing! It was good the next day, too. I'd love to try it with the broccoli! I never used cottage cheese in place of ricotta, but if I had to, I think it would work. I have not used gluten free crumbs, I did try them with almond meal but was not a fan. I might leave the crumbs off for a gluten free option. I made this recipe tonight and my boyfriend and I LOVED IT! Today was the first time I had ever seen this site and will be back! Thank you for the great recipe. This was SO incredibly yummy!!!! Best 5 point dinner ever! Made with sauteed snow peas and rice pilaf. Delish!! Have you ever used any gluten free bread crumbs? I just found out that my 14 year old son is allergic to wheat. AMAZING, I love these, I can't believe they are only 5 pts each. My husband loved them too. I'm definitely going to make them again soon. Perfectly simple, perfectly delicous. My husband can't wait for me to make them again! I made this tonight and it was delicious! I shared it with all my FB friends as well. I dont like ricotta cheese so i substituted with low fat cottage cheese. sooo good! Made these tonight and they were AMAZING! And really quite easy! Can't believe they are only 5 points. Planning on freezing the rest, since as a single gal trying to loose a few pounds but not wanting to eat so many pre-packaged, processed foods I'm trying to cook more. Made the kalua pork this weekend and that was fantastic too. Thanks for what you do Gina. I made this last night for the first time and it was delicious! I am not much of a cook but lately I am experimenting more. I was so proud of myself. Great dish!! I just finished making these, yummiest things ever!! Thank you for another amazing meal! Mmmmm, that stuffing looks amazing. Same thing could happen with some pork tenderloin as well. Thanks for sharing! Made this tonight and it was so yummy! It tasted indulgent, but I was so glad it was only 5 points. I used Newman's Own marinara, but other than that I followed the recipe as written. I can't wait to take leftovers to work tomorrow. I am new at cooking, but I made this last night and it was AWESOME! My husband loved it and it was in my diet! Thanks! Made this last night- a little labor intensive, but delicious! And I can't believe the low WW P+! THANK YOU for sharing these recipes and sharing the points plus values. I got a little hung up on the "6 tablespoons of egg whites" but after looking it up, I learned each egg white is 2 1/4 Tb, so I just used three. 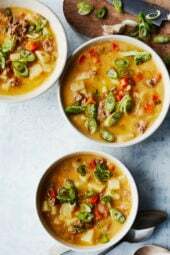 Tonight I'm going to try the sausage and bean soup. Thanks again! Two teenage sons both said "As good as anything we can get at a restaurant". Thanks for such a great recipe that is both light in calories and easy to make! I'm not a big cook, but your step-by-steps are great. I tried this tonight–mine didn't look near as pretty, but it tasted AMAZING!! Thank you! This is SOOO good! I made it with fresh spinach because I was trying to use up a bag. Hubby scarfed down 2 servings and I was soo tempted to join him! Saved a portion for lunch Monday instead. I laughed out loud though, because when I was putting the leftovers in a container, he took the spoon from me and made sure every single scrap possible was scraped out of the casserole dish– he didn't want me to accidently throw a bite away! I totally just realized that in trying to halve this recipe I forgot to put the mozarella in the spinach mixture and my chicken is already rolled up and ready to go…oh well it seems like it should still be good. I will still put some on the top at the end of baking. Yummy! I made this tonight, and it was fantastic! I only added a bit of chopped garlic to the spinach mixture because I am a huge garlic person. My whole family enjoyed it! I just love this site! I can't wait to try this recipe!! Your blog is an inspiration to everyone trying to stay healthy! I made this for dinner tonight and we loved it! Thank you so much for a great tasting, low calorie dish! My son and I made this dish last night – homemade pomodoro sauce & all! We loved it! I will be making this again. Delish! I have been basically living off of your recipes lately. Every single one has been delicious, and I finally feel like I can eat delicious food and be healthy! We made these chicken rollatinis for our New Years dinner, and really enjoyed them! I posted a picture over on my blog. If it's okay with you, I'd like to add your website to my blogroll because I love your website so much. Thanks for making such great recipes! Long time lurker here! Got a TON of your recipes in my file. We made this tonight and my 3 and 2 yr old went crazy for it! Thank you so much for all your hard work with this site!!! This was insanely delicious and so easy to make! I have yet to make something from this site that is bad. THANK YOU!! I was surprised at how easy these were! Really the first "stuffed" chicken I've ever made successfully. I love that you don't even have to bother with toothpicks. I used regular chicken breasts and sliced them in half for thin cutlets (a bit tricky but I got the hang of it). The end result was delicious and filling with a caesar salad on the side. 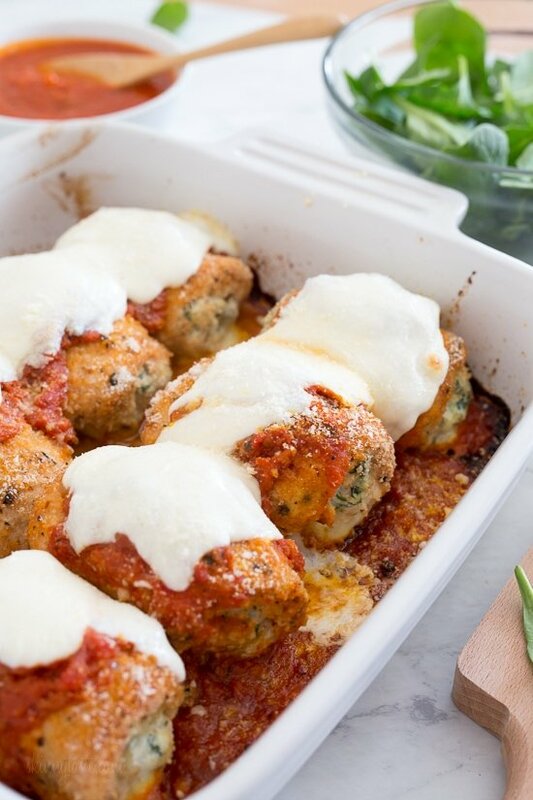 Hi Gina, I've been a fan of your site for sometime now but don't comment alot even though I've tried and liked many of your recipes, but, I had to tell you that every time I make this one it gets better and better. It's on the menu for tonight with a small side of pasta and a small salad. Can't wait for your homemade sauce to be ready so that I can finish it up. I'm going to freeze leftovers for another meal. Has anyone tried freezing them and if so is it better to freeze cooked or uncooked chicken. So glad to hear you all loved it! Your site is so helpful- especially for a cooking novice like myself! Thanks again. My girlfriend decided to make these tonight with my help of course, and let me tell u , what a treat. Although I'm not a big lover of spinach, the combo of sauce , cheese, chicken, of course, and spinach was simply splendid. With a side a angel hair pasta with the pomodoro sauce, and a glass (bottle!) of chianti, it made for a terrific dinner. And the best parts is, seconds will be had for Monday night football. BRAVO!!!! I made this and my kids and my husband loved it!! I have a very very pickey 4 year old and she ate every last bite. It was hard to get her to take the first bite but as soon as she did, she cleaned her plate! So so so good!! Thanks for a wonderful site, as a working mom I always am looking for great healthy meals and this is where I come every Sunday as I do my planning for the week. I suppose you could use zucchini instead, shred it and saute it first, then mix it with the cheese. 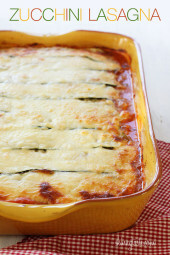 I made this the other night and it was fantastic…We enjoyed it so much that I also used the Spinach filling as a base for manicotti…just added a little crushed fennel seed and some extra ricotta, parmesan, and spinach and there was plenty to fill an entire box of shells!! Your recipes are great! Thank you! I prepared these the night before I served them, and although I was worried they would be soggy, they came out great! This was the second time I've made these, and there were a few things I did differently that I think made them better. First, I made sure to really squeeze the spinach dry, including following Gina's suggestion to use a paper towel to get any excess liquid out. Second, I bought the thin chicken cutlets, but I also pounded them to make sure they were all even thicknesses. I think this also tenderized the meat a bit. Lastly, I used panko bread crumbs which added a little extra crunch. Both times I made these were a hit with no leftovers! We just finished making, and devouring, these! They are so delicious, juice and flavorful. Mine came to a few more points that the 5 posted here (I think because I used a larger piece of chicken breast), but it was still under 8 points and for such a filling dinner, it's still perfect in my book! Thanks for all your wonderful recipes! Freezer safe? Anyone tried it? This is my first SkinnyTaste recipe that I've tried. It was excellent and boyfriend approved! I think this might be added to one of my regular recipes! Very excited to try other recipes too! Made these tonight and they were fantastic! My parents loved them. Thanks for another winner, Gina! Finally got round to making this for the first time, I'm the one who asked if ricotta cheese would be suitable for someone with lactose intolerance, answer is not really, not even for the mild intolerant ones. Just thought I will post this so other people with similar problem can find a substitute for the ricotta cheese. Made this last night and it was awesome! Changed up the steps a little bit to dip chicken cutlet in eggs, both sides in breadcrumbs/parm mix; spread ricotta/spinach/mozz mix; then roll and place in pan. (Just like the prosciutto rollatini). This was really, really good and totally worth the time to put together. Next time, I will probably add some garlic and onion to the filling. The only change I made tonight was using Vodka sauce instead of straight marinara – we just aren't fans of tomato sauce. I loved this recipe. I added a few spices to the spinach cheese mix. It was REALLY good. It is now in my cooking rotation. Thanks so much.If I can find recipes this good I can continue to lose weight and keep it off for good. I made this recipe last night (along with the Santa Fe Chicken)and OMG, it's awesome! 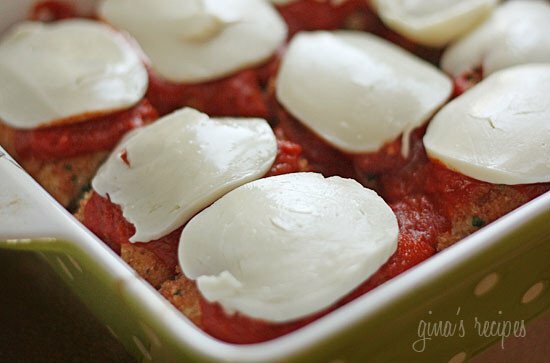 I did make one substitution, swapped out the ricotta cheese for low fat cottage cheese. My roommate doesn't like ricotta. It still came out phenomenal! Thank you for the recipes! They really make me feel like I know how to cook! I made this last week and it was simply delicious!! My guests really enjoyed it, and I can't wait to make it again. Thank you for all of your wonderful recipes! I made this for dinner last night and it was soooo good! Although I am not surprised… I have never tried one of your recipes we didn't like!! I contemplated halving the recipe since it makes quite a bit, and there's only me and my husband eating them, but I went ahead and made the whole thing. I just only put the sauce and cheese on 4 cutlets, and saved the other 4 for tonight. I'm so glad I made the whole batch… my husband ate 3 cutlets last night, and as soon as he finished he asked, "Can we have these again tomorrow night too?" LOL… he LOVES all the cheese. Tonight I am going to serve them with the creamy cauliflower puree and can't wait for dinner!! I made these tonight and omg…. so.good. I do have to say that one cutlet was not enough…..not because I wasn't full, but because they were so good I wanted to eat the whole pan. This was absolutely wonderful! I served it for dinner with my mom and it was really, really good. Thanks for this recipe & your blog. Bravo! I made this for my family on Sunday and they loved it. It was so easy to make and was wonderful. The filling was great. Another meal to add to the favorites. You are great at what you do and I would love to see you make a cookbook. It would be nice to have something right at my finger tips in the kitchen. Thanks Gina! This is delicious and easy and reheats so well! Thank you Gina, again!! Jen- before draining, funny are they making boxes of spinach smaller these days? Gina – you truly are talented and I really appreciate all of your hardwork on this blog. I made this tonight and it was (surprise – surprise) a huge hit with my husband. I had extra spinach filling and he had hinted that I make it again tomorrow. Thanks again for the delish meal and all of the time you put into this amazing blog! This was fabulous! Will definetly make this again! Whole family loved it! This has become a new family favorite. Perfect and pretty too!!! You could replace the ricotta with mozzarella, although I'm not sure that wouldn't be an issue for someone who is lactose intolerant. Hi, someone I know has lactose intolerance (not severe though I think) Would there be a good substitute for the ricotta cheese? Because I heard they're really bad for people with lactose intolerance. Your recipes look sooooo yummy! !